Armando Iannucci's lacerating, hilarious comedy lampoons Stalinist Russia to within an inch of its life. Accepting the old adage about comedy being tragedy plus time, it still feels about half a century too soon to be mining the savage tyranny of Stalinism for gags. But writer-director Armando Iannucci (‘In the Loop’) has managed it – and then some – pulling off the most essential British comedy since ‘Four Lions’ in the process. Like Orwell on helium, this reimagining of Stalin’s demise and the subsequent ideological gymnastics of his scheming acolytes is daring, quick-fire and appallingly funny. Finding him in 1953 in a Moscow that’s alive with paranoia and purges, we meet Stalin (Adrian McLoughlin) on bullying form. But before long, the much-feared dictator is lying comatose on the floor after a stroke sparked by a brave citizen’s angry letter of protest (yes, they’re that rare). As Uncle Joe wanes – a decline karmically hastened by the fact he’s sent all the competent doctors to the gulag – potential successors leap into the vacuum. Steve Buscemi’s wily Khrushchev, Jeffrey Tambor’s dim-witted deputy chairman Malenkov and Simon Russell Beale’s secret police chief Beria lead the charge, hoping to seize power or just stay alive in the fallout. 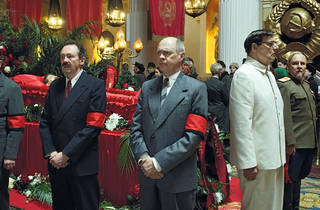 Michael Palin (Molotov) and Paul Whitehouse (Mikoyan) round out a politburo stuffed with comedy greats. What follows is a riotous farce of doublespeak and plotting laced with moments of bitumen-black horror. Iannucci’s control of tone is such that we’re carried from hilarity to revulsion and back again in a few keenly crafted lines of dialogue. It’s much darker terrain than his comic dissections of US and British politics, ‘The Thick of It’ and ‘Veep’ – uncomfortably so at times. Beria, the Soviet system’s brutal id, scratches names off lists and rapes young girls he keeps in dungeons. He’s the primary villain in a film that’s overflowing with them, and Russell Beale brings oily glee to the role. Delivering more bullocking menace is Jason Isaacs’s war hero Zhukov, who pitches up with a chest full of medals and a heap of juicy lines. (‘I fucked Germany. I think I can take a flesh lump in a waistcoat,’ he boasts.) But the real star here is the man behind the camera, who proves that he can tickle the funny bone one minute and cut right through it the next. To terms like ‘Pythonesque’, it may soon be time to add ‘Iannuccian’. The man is a master. I am of the dislike camp on the Death of Stalin in all ways possible. No matter how we try to disregard the facts and book this film in as black comedy, the comedy part really doesn't come across. It can work - we have seen it before - but in this case the balance between providing a realistic image of Stalinist-era Russia and satire just didn't work. Neither was the plot made interesting; the jokes fall flat and even the actors seem to know. The best I managed were a couple of smirks, mostly based on situational comedy rather than actual attempts at jokes - but the young couple of 16/17 were laughing their asses off at every fart joke-line, so I guess we know which audience is really captured by the film. I really love do have respect for all of these actors (especially Steve Buscemy and Lucius Malfoy) but this is just a bad attempt at laughing something terrible off. Does not work and not worth the cinema trip unfortunately. People seem to either love or hate Death of Stalin; I'm thoroughly in the 'love' category. The dark humour is very, very dark, and the moments of actual horror mean you can't accuse anyone of whitewashing history. Armando Iannucci's political satirising is on form with the discussion of the minutiae of post-Stanlinist politics, and the cast that are just magnificent. Jason Issacs, in particular. Everything about the film feels like it has been intensley, carefully planed and executed, which hsd resulted in something wonderful. If you're a fan of Armando Iannucci and/orpolitical comedy, then this one is defiitely for you! I wasn't particularly expecting to enjoy this film but it was fantastic. The idea of combining comedy with such a dark period of history seems slightly insane but it works brilliantly providing a thought-provoking insight to what was frankly a surreal time. All of the actors are great, all thoroughly unlikeable and completely watchable. The elements of farce were particularly ingenious. It has made me think about what the world must have been like for these people in a way a documentary or more serious film could never have achieved. Obviously some other reviewers don't agree but just see it! This isn't a good film. Trying to make a comedy about mass arrests, torture, sexual abuse and the murder of millions was always 'bold', and "Life is Beautiful" this certainly is not. It staggers between being serious and being mildly amusing, without ever being funny, or doing justice to the gravity of the story. Some of the performances are good, and the film just about keeps your interest until the end, but it is ultimately a pointless film, offering neither insight, a meaningful message, or outstanding comedy. I really don't understand how Time Out can think it deserves top rating? Having read some excellent reviews, I was, quite frankly, disappointed. I know humour is personal but I really didn't find most of it amusing. Stalinist Russia in the early 1950s was not a happy place to be and that came across loud and clear. Lists were followed in a programme of shootings and humiliations. The inner sanctum of secretary generals and other powerful men were constantly on edge in case their name should find its way onto such a list. So after the slightly amusing death of Stalin should these men have felt more relaxed? No, because each one could have stabbed the other in their back. Not a film I would rush back to. Enjoyable historical romp with sharp and at times brutal satirical bite. Can't help but feel this might have worked better as a play - it has a strong feel of French farce / absurdist theatre about it - but Iannucci directs with an assured hand. Directed and co-written by Armando Iannucci, this very well received movie left me a little disappointed. With a cast of all-round greats including Steve Buscemi, Simon Russell Beale and Paul Whitehouse, it certainly looked like a sure-fire black comedy treat. Nevertheless, despite some super jokes, its treatment of events leading up to Stalin’s death and the power struggle afterwards was disappointing. Iannucci’s TV pedigree is unarguably brilliant with his bunch of successful series but he overcooks the omelette on this one. So many scenes depend on shouted obscenities and gross toilet humour that sharp wit and clever scripting seem to be ignored. It often reminded me of some sad third-rate stand-up comics who depend on being crude and breaking taboos (however many are left!) to raise cheap laughs. Stalin and his creepy gang of psychos and gangsters are almost beyond parody so the director has a formidable task. A TV play directed by Jack Gold in the 1980s, “Red Monarch” (anyone remember besides me?) was much darker and funnier than this and nailed the whole ghastly scenario far better than Iannucci’s effort. Not bad but not particularly good, I am sorry to say. While it's stunning to look at, and Jason Isaacs' performance is a joy, I felt like leaving for most of the movie but social obligation meant I stuck with it. I found it vicious and cruel. Not my sense of humour. I suspect it's marmite. There's nothing 'essential' about Iannucci's Commie Comedy. All the elements are there for hilarity, but it does not deliver any. Once the lights go down in the cinema I felt somewhat drowsy....like I was listening to Stalin's cronies reciting policy. As usual, Time Out wets the bed when it comes to so-called alternative humour. 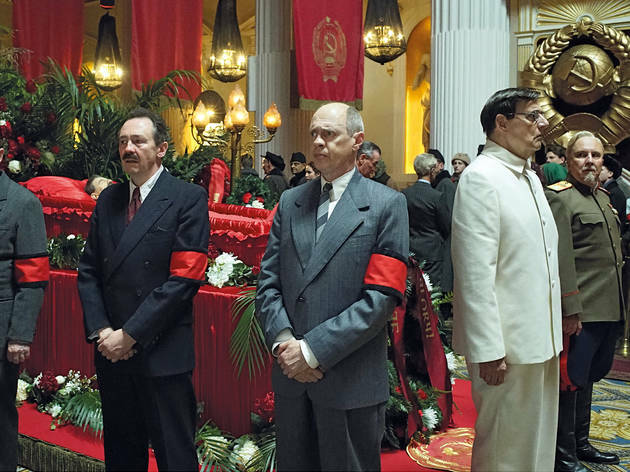 Death Of Stalin ultimately plays like one of Python's poorer sketches. Ninotchka is much more amusing! You might get whiplash from this film's shifts in tone, from absurdist comedy to horrifying history. And it can be hard to keep track of all the characters, who could be rendered more distinct. In particular, the film's attempts to give women something to do fall flat. But the overall idea, of crafting a comedy out of the aftermath of Stalin's death, is audacious and impressive. And there are genuine laugh-out-loud, I-can't-believe-that-happened moments. A fairly interesting story filled with plenty of cheap laughs and toilet humour like seen in bottom. Although a stellar cast the film is just not my thing. Really disappointed.